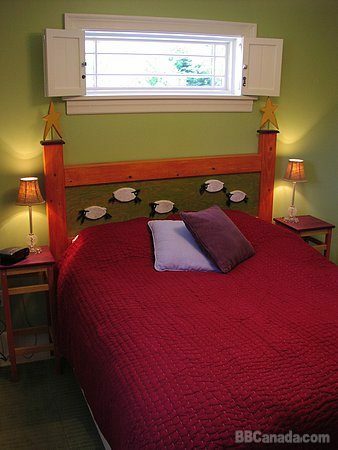 The Just B Lodging suite occupies the former scullery in this circa 1870’s home. Located at the rear of the house, this bachelor apartment style suite is bright and cozy. With a handmade queen size bed at one end, full kitchen at the other and couch and table in between you are set for anything. Come and go as you please through the separate entrance. The private deck overlooks the garden. The room also sports a 4 piece bath, cable TV & DVD, internet access, phone, BBQ, cot and hide-a-bed. We invite you to indulge in the updated comfort of yesteryear’s laundry room.